I would like to compute an effect size for the difference between the areas under two receiver-operating-characteristic curves. There are methods for computing standard errors, variances, and covariances of estimates of those areas, and of course p values, but I haven’t seen an effect size index. What field are you in? I am not familiar with “receiver-operating-characteristic curves” so I’m afraid I can’t suggest an ES index. If you are dealing with samples, and it sounds like you are,then I am sure you must be able to calculate an effect size index. Usually the best way to find out the names of indexes relevant to your particular discipline is to Google “effect size” along with terms associated with your area. You’d be surprised what turns up. All the best with your research. the area under curve already is a kind of effect size. There is a short paper by Rice and Harris from 2005 (DOI: 10.1007/s10979-005-6832-7) where you can find a table comparing AUC, d, and r, to by able to compare these indexes. This is based on tables by Pearson and Hartley, 1954. 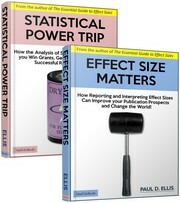 I bought The Essential Guide to Effect Sizes and your pdf on Effect Size Matters. On page 99 in The Essential Guide to Effect Sizes you state that “Before these effects can be combined they will need to be transformed into a common metric”. Is there a way or book that will show show me how to turn a R squared and Beta into a Pearson r? To turn an R-squared into an r you unsquare it. Actually, that’s not technically a smart thing to do because an R-squared will typically reflect the associated between numerous variables while an r measures the degree of association between two. Thanks for your help. Happy Holiday!